Trope nominalists claim that resemblance is a primitive relation. There are two well-known arguments that aim to prove that such resemblance leads to a vicious regress. On the one hand, Bertrand Russell famously argued that resemblance relations imply an infinite series of resemblances holding between them. On the other hand, less famously, Edmund Husserl claimed that resemblance must be grounded in identity, for otherwise it falls into a vicious regress. In this paper, I argue that these arguments are intimately connected and, in fact, form a single complex case against nominalism. The point is that the standard solution to the Russell regress, which takes resemblance to be an internal relation, leads to the Husserl regress, and vice versa: a solution to the Husserl regress is possible when resemblance is taken to be an external relation, which immediately leads to the Russell regress. Armstrong D. M. (1978a), Universals and Scientific Realism, t. 1: Nominalism and Realism, Cambridge: Cambridge University Press. Armstrong D. M. (1978b), Universals and Scientific Realism, t. 2: Theory of Universals, Cambridge: Cambridge University Press. Armstrong D. M. (1989), Universals. An Opinionated Introduction, Boulder: Westerview Press. Arystoteles (2000), Metafizyka, tłum. T. Żeleźnik i in., Lublin: Redakcja Wydawnictw KUL. Bambrough R. (1976), Universals and Family Resemblances [w:] Universals and Particulars. Readings in Ontology, M. J. Loux (ed. ), Notre Dame–London: University of Notre Dame Press, 106-124. Bergmann G. (1967), Realism, Madison: The University of Wisconsin Press. Bocheński J. M. (1993), Zagadnienie powszechników, tłum. T. Baszniak [w:] Logika i filozofia. Wybór pism, Warszawa: PWN, 79-105. Boecjusz (2009), Drugi komentarz do Isagogi, tłum. T. Tiuryn [w:] T. Tiuryn, Boecjusz i problem uniwersaliów, Wrocław: FNP, 401-408. Brownstein D. (1973), Aspects of the Problem of Universals, Lawrence: University of Kansas. Campbell K. (1990), Abstract Particulars, Cambridge: Blackwell. Daly C. (1997), Tropes [w:] Properties, D. H. Mellor, A. Oliver (eds. ), Oxford: Oxford University Press, 140-159. Dawes Hicks G. (1923), Are the Characteristics of Particular Things Universal or Particular, "Proceedings of the Aristotelian Society. Supplementary Volumes" 3, 123-128. Florenski P. (2009), Sens idealizmu. Metafizyka rodzaju i oblicza, tłum. 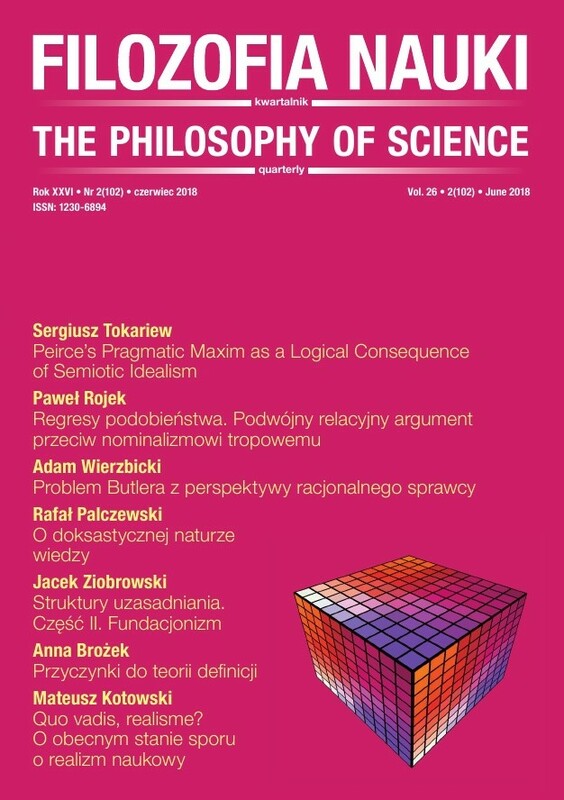 P. Rojek [w:] Sens idealizmu. Metafizyka rodzaju i oblicza oraz inne pisma, T. Obolevitch, P. Rojek (wybór i oprac. ), Warszawa: Wydawnictwo IFiS PAN. Grossmann R. (1994), The Existence of the World. An Introduction to Ontology, London— New York: Routledge. Hochberg H. (2004), Relations, Properties, and Particulars [w:] Relations and Predicates, H. Hochberg, K. Mulligan (eds. ), Frankfurt: Ontos, 17-54. Hume D. (2005), Traktat o naturze ludzkiej, tłum. Cz. Znamierowski, Warszawa: Aletheia. Husserl E. (2000), Badania logiczne, t. 2: Badania dotyczące fenomenologii i teorii poznania, część I, tłum. J. Sidorek, Warszawa: Wydawnictwo Naukowe PWN. Johansson I. (1989), Ontological Investigations, London: Routledge. Kim J. (2002), Umysł w świecie fizycznym. Esej na temat problemu umysłu i ciała oraz przyczynowania mentalnego, tłum. R. Poczobut, Warszawa: Wydawnictwo IFiS PAN. Metaphysics of Relations, A. Marmodoro, D. Yates (eds. ), Oxford: Oxford University Press, 1-18. Martin C. B., Heil J. (2008), Zwrot ontologiczny, tłum. M. Bucholc, T. Ciecierski [w:] Analityczna metafizyka umysłu. Najnowsze kontrowersje, M. Miłkowski, R. Poczobut (red. ), Warszawa: Wydawnictwo IFiS PAN, 262-298. Maurin A.-S. (2005), Same but Different, "Metaphysica" 6(1), 129-146. Maurin A.-S. (2007), Infinite Regress: Virtue or Vice? [w:] Hommage à Wlodek, T. Rønnow-Rasmussen, B. Petersson, J. Josefsson, D. Egonsson (eds. ), http://www.fil.lu.se/homageawlodek. Mertz D. W. (1996), Moderate Realism and Its Logic, New Haven: Yale University Press. Moore G. E. (1922), External and Internal Relations [w:] Philosophical Studies, New York: Harcourt, Brace and Co., 276-309. Moreland J. P. (2001), Universals, Chesham: Acumen. Ockham W. (1971), Suma logiczna, tłum. T. Włodarczyk, Warszawa: Państwowe Wydawnictwo Naukowe. Platon (2002), Parmenides, Teajtet, tłum. W. Witwicki, Kęty: Antyk. Poczobut R. (2000), Superweniencja. Zarys problematyki, "Filozofia Nauki" 8(2) , 25-44. Price H. H. (1953), Thinking and Experience, London: Hutchinson. Rodriguez-Pereyra G. (2002), Resemblance Nominalism. A Solution to the Problem of Universals, Oxford: Clarendon Press. Russell B. (1910), The Monistic Theory of Truth [w:] Philosophical Essays, London: Longmans, Green and Co., 150-169. Russell B. (1995), Problemy filozofii, tłum. W. Sady, Warszawa: Wydawnictwo Naukowe PWN. Russell B. (2011), Badania dotyczące znaczenia i prawdy, tłum. J. Wawrzyniak, Kraków: WAM. Searle J. R. (1959), On Determinables and Resemblance, "Proceedings of the Aristotelian Society. Supplementary Volumes" 33, 141-158. Segelberg I. (1999), Properties, tłum. H. Hochberg, S. Ringström [w:] Three Essays in Phenomenology and Ontology, Stockholm: Thales, 133-233. Szymura J. (1990), Relacje w perspektywie absolutnego monizmu F. H. Bradleya, Kraków: Wydawnictwo UJ. Szymura J. (2011), Nominalizm [w:] Przewodnik po metafizyce, S. T. Kołodziejczyk (red. ), Kraków: WAM, 161-210. Trogdon K. (2013), An Introduction to Grounding [w:] Varieties of Dependence. Ontological Dependence, Grounding, Supervenience, Response-Dependence, M. Hoeltje, B. Schnieder, A. Steinberg (eds. ), Munchen: Philosophia Verlag, 97-122. Williams D. C. (1953), On the Elements of Being, "Review of Metaphysics" 7, 3-18, 171-192. Williams D. C. (1963), Necessary Facts, "The Review of Metaphysics" 16(4), 601-626.